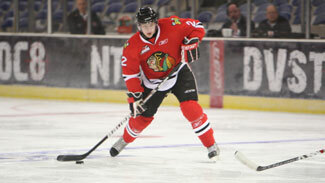 When one of his Portland Winterhawks teammates was asked to describe defenseman Troy Rutkowski's offensive abilities, he replied, "He's got some of the sickest dangles I've ever seen." Rutkowski's offensive skills are unquestioned. The 6-foot-2, 208-pound blueliner had 12 goals and 43 points in 71 games this season, and added 7 points in 13 playoff games. He earned an invitation to January's CHL/NHL Top Prospects Game and is No. 44 on NHL Central Scouting's final ranking of North American skaters (No. 14 among defensemen) for the 2010 Entry Draft. But maybe the most impressive part of Rutkowski's stat line was his plus-13 rating (and plus-6 in the playoffs), which is a vast improvement on the minus-22 he had in 64 games as a WHL rookie last season. "This year a lot I've been working with (assistant coach) Travis Green and we've been keying more in the defensive zone and picking my spots when I go up," Rutkowski told NHL.com. Scouts certainly saw positive things. "He has worked hard through the course of the season on fitness and his all-round defensive game," Central Scouting's B.J. MacDonald, who scouts Western Canada prospects, told NHL.com. "He has good offensive instincts, which is hard to teach. He knows when to jump up in the play to make an odd-man situation, which is a huge plus. He can be taught better defense as he matures. He has good size so he will learn to be stronger in his own zone, and his containment is improving. I think he is a smart enough player to realize he can balance both facets of game to be successful at the next level." Rutkowski understands how important it is to round out his game. His favorite player is the Washington Capitals' Mike Green. Green is one of the top-scoring blueliners in the NHL, but he was a plus-24 last season, and finished third in the League with a plus-39 this season. "It's something you have to think about all the time and think about where you are in the defensive end and what you should be doing," said Rutkowski. "It's a bit of a challenge, but it's worth it. It's just more of the little details." Rutkowski's commitment is spreading to the team, which has cut it's goals-allowed by more than half a goal per game, from 4.00 last season (when they finished with the second-fewest points in the league) to 3.35 in 2009-10 (they were fifth in the WHL Western Conference). "I think this year it's been a lot better," said Rutkowski. "It's helped that our team is a lot better. I think this year has been a little bit better." If you ask Portland coach Mike Johnston, things have been a lot better, especially with Rutkowski. "He's committed to his overall game," Johnston told NHL.com during the season. "I've seen a big change in Troy this year. I just watch his preparation for games. He's a lot better prepared and I watch how he is after games, he stretches and has a workout. His overall routine is more like a professional. From the defensive part of the game, he takes as much ownership as he does in his offensive production."